Our international mobile hotspot rental works in over 70 countries include all of Europe, Australia and New Zealand plus several destinations in Latin and Central America. The Wi Fi hotspot rental offers virtually unlimited 4G LTE data for travelers. You can use it in one destination or roam seamlessly from one country to another, which is particularly important in Europe as many travelers tend to visit multiple European cities during their trip. 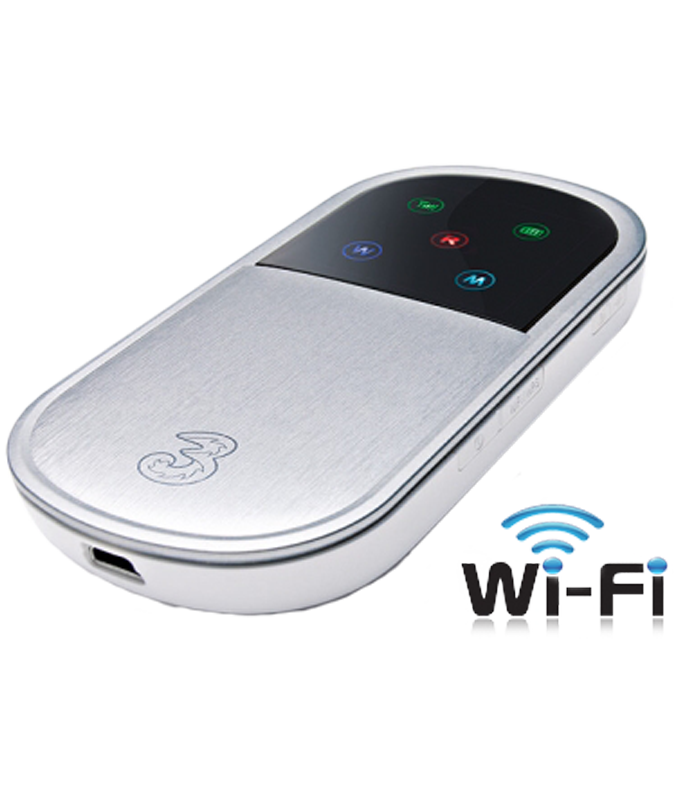 The mobile hotspot is a portable device about the size of a small cell phone that transmits your own secure Wi Fi hotspot with blazing fast LTE/4G connectivity (when available, otherwise, 3G). You can use a Wi Fi hotspot with any Wi Fi enabled device including cell phones (even those locked to a specific carrier), tablets, PCs and any other device with Wi Fi. Up to 10 devices can connect at the same time making this ideal for one person or even groups of people. The Mobile Hotspot Rental is very easy to use and eliminates the need to get roaming and data plans with your carrier which are often not available for many devices (like your iPad) and are expensive and offer very little data and/or offer slow data. The mobile hotspot uses Three, one of the fastest growing carriers in Europe. While coverage is never possible 100% of the time in all locations, Three's 4G and 3G coverage is extensive. Please note that if your trip is more than 2 weeks or if you are a frequent international traveler, it is less expensive to Buy an International Mobile Hotspot. There are many benefits of renting a mobile hotspot. The main benefits are the convenience and the savings. Having your own mobile hotspot allows you to access the internet anywhere, any time with any device or even multiple devices simultaneously. You can use useful travel apps such as Google Maps, Trip Advisor, Skype, WhatsApp plus you can check your emails and browse the web whenever and wherever you want. In addition, unlike free Wi Fi, you will have a secure internet connection. The last thing you want to have happen to you is to have your credit card or bank accounts hacked while you are traveling. With a mobile hotspot, you do not have to figure out the roaming fees that your current carrier charges in Europe. Simply turn off data roaming on your device, switch on Wi Fi, enter the password on the back of the device and you are ready to go. You can even make phone calls if you use an app such as WhatsApp or Skype. Please note that, although it is standard policy in the cellular business to advertise the term, "unlimited" and then in the terms and conditions clarify that there is a "Fair Usage Policy" that specifies caps, Cellular Abroad wants to make it clear that users have 12GB of high speed data per each 30 day period. If your trip is between 30-59 days, we will include a secondary data SIM card that offer an additional 12GB of data. This is a significant amount of data yet it is a cap. All the companies that Cellular Abroad is aware of, including those advertising unlimited data have significantly lower caps despite what they advertise. Cellular Abroad is in the business of providing quality cellular and data service with transparent pricing and therefore, it is important to underline that, while the service is virtually unlimited, there are limits although these limits will effect a very small percentage of users. Just how much is 12GB of data? 12GB of data allows you to browse approximately 120,00 webpages, read 24,000 emails and download approximately 24 hours of good quality video. *And other international destinations. Please check the Coverage tab for all countries covered. *7 day minimum. You will receive 12GB of data per each 30 day period or portion thereof. For example, if your rental is for 32 days, you will receive 12GB of data for the first 30 days and an additional 12GB of data for the remaining 2 days. Ordering Cellular Abroad's European (and other countries) Mi Fi Rental is easy. You can order online or speak to one of our expert advisors at 800-287-5072 and they can place the order for you. Time permitting, we deliver the MiFi Rental 2 business days prior to you departure using UPS or FedEx. We can deliver the following day (except Sunday) for those with immediate departures. You will receive a fully charged MiFi, complete with a convenient travel pouch and international chargers and plug adapters and simple instructions. If you have any questions, please call us or email us. The Cellular Abroad international MiFi Rental is ready to go. When you arrive at your overseas destination, simply turn it on, enter the password on your device and you are ready to connect to the internet. Please do not use it outside of the coverage areas as it may not work when you go abroad or it may initiate the 30 day. We will send you a return label with your package. Please retain it and, upon return from your trip, drop off the package at FedEx or USPS (as per instructions) within 2 business days from the last day of your rental period. Extra SIM(s) card for periods beyond 30 days. How much 3G speed data usage do I get? Round-trip shipping and handling fee. When do I get the MiFi? You will receive your cell MiFi rental two days prior to your departure, unless you require next day delivery. Yes it does, but it's always best to test the battery and charge the MiFi before your departure. Yes, you will receive an international charger and relevant plug adapters, so you can charge the MiFi in the U.S. or at your destination. The coverage is typically very good. Our service is on the Three network. Yes, rental insurance is available for $29.50 as an add-on once you add your item to the cart.